With mobile devices now becoming the primary means of telecommunication, the positive influence of mobile technology is very evident in way the average Nigerian connects with people, access information, and also socialise. Boasting of the largest mobile market in Africa, Nigeria has a total of 114.8 million subscribers with smartphone penetration rate of 25%, according to TNS. 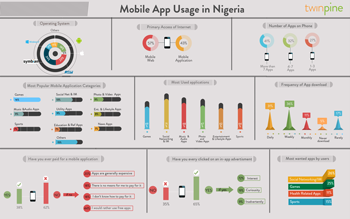 With the aim to analyse the growth of mobile technology in Nigeria, Twinpine, Africa’s foremost Mobile Ad Network carried out a survey on the usage of mobile applications on smartphones in Nigeria. According to the survey, 57% of smartphone users access the internet through the mobile web browser, while 43% do so via mobile applications. The study also showed that 34% of smartphones ran on Symbian, 23% on Blackberry operating system which is closely followed Google’s android with 18% market share. Also looking at the number of mobile apps installed on phones, the surveys reveals that 41% of mobile device users have over 7 applications on their phones, 32% have between 4 to 7 applications and 27% have about 3 applications on their mobile devices. The survey also reveals the share of mobile apps categories. While games apps had the highest share of 16, social network apps/IMs was next with a share of 13%. photo and video application, Music applications, Utility Applications had a share of 9% each. Also included in the report are refuency of app download, how mobile app users relate to in-app advertising, purchase of mobile apps et.c.